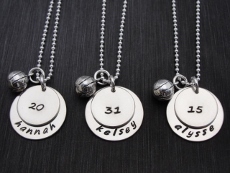 A 3/4" sterling silver disc is stamped around the bottom with the player's name or nickname. Then a 9/16" disc is stamped in the center with the player's number and a favorite sports charm is added. The discs are hung on sterling silver ball chains which come in 16", 18", or 20". To order this item, please select a style, enter name and jersey number, choose sports charm and chain length, . Then click the Add to Shopping Cart button. If you don't see your favorite charm, email me and I can try to find it.